Enjoyed the stay very much. Loved the creek noise of water flowing. Very peaceful and relaxing. Very nice. Beautiful view. We had a friendly dog that was there to greet us every morning. The staff took care of my reservation with no problem , sent emails with updates and any information needed upon arrival!! Great staff!! We absolutely loved Honeymoon Creek! Beautiful cabin and beautiful scenery. I only had to email the team to ask a question I had about the road to get the cabin. I got a response the same day. Two days before my check in date I received an email with important information. Very professional. The cabin was easy to get to and beautiful. While there were other cabins nearby, we still felt secluded. The stream beside our cabin was peaceful. The cabin itself exceeded our expectations. I only had contact with the maintenance contact people via phone. She seemed both friendly and professional. This has to be the best stay for me and my family that we have had in a long time. The cabin was exactly as advertised and we had a blast. We are already talking about the next gathering. New property (2018). Cozy and clean. Loved being right by the stream. That sound is something from my youth and is always soothing. My wife and I had a great restful weekend. 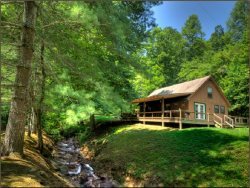 Property was perfect, site was secluded, cabin was nice and clean, and well equipped! Would definitely stay again! I arrived in Bryson sooner than expected. The team at Hidden Creek cabins allowed us to check in earlier. They were very friendly. The guy who came out to get the trash and check the hot tub was very nice. The property was awesome! It was very secluded and the perfect place to get away. This was our second trip to hidden creek cabins. We will definitely be back! A very nice cabin right beside the creek. Very peaceful and relaxing weekend. Would certainly stay again! Everyone friendly, informative and knowledgeable. We really enjoyed the grounds and the cabin. Will likely visit again! Great people!! so laid back and professional. great clean place to stay, wonderful experience. Couldn't have been a better place to stay. We stayed in Maggies cabin and it was exactly what we were looking for. It was secluded and the scenery was beautiful. The house was warm and cozy. The hot tub was ready to go and we had a great view. We made use of the fire pit for several hours, and had a perfect clear view of the sky and all the stars. I will definitely come back. Cozy little cabin with easy access to Bryson City! Would definitely stay there again! We celebrated birthday and anniversary. Honeymoon Heaven was a hidden gem with nice touches. We will definitely use Hidden Creek Cabins again.